Dubai is a shopper’s paradise alright, but a month-long extravaganza more famously known as the Dubai Shopping Festival[DSF] has millions of visitors flocking to Dubai between January & February every year. What started off as an initiative by the government to boost trade in the country has now transformed itself into an annual event; almost every shop, every Mall and souq in the city participates enthusiastically by announcing genuine sales and exciting promotions with the intention of enticing customers into emptying their pockets then and there . And mind you its not all about shopping, there are also carnivals, street shows, concerts, children’s entertainment, fireworks, film festivals, extravagant raffle prizes and the famous Dubai World Cup horse race all offering a welcome break from the shopping frenzy. 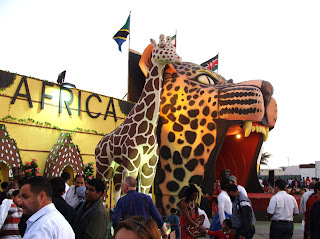 And one of the major attractions is the Global Village[GV] which in 1996 was a small area along the Dubai creek which housed a mere 10-12 stalls selling handicrafts & wares from different countries. The novel theme gained so much popularity that now 14 years later around 45 countries from all around the world participate to showcase their merchandise, culture and cuisine. Like they say here; it’s probably the only place in the world where you can buy an intricately-woven Indian pashmina shawl, a Japanese bonsai and fresh Canadian Maple Syrup all from the same place. Since the Global Village opens only in the evenings[4pm-1am] it is simply not possible to cover all the pavilions & enjoy the entertainment provided all in one day…..unless ofcourse we hurry really fast but then you end up more tired than a happy tourist. The most widely- accepted among all the pavilions are the Chinese and the Indian pavilion, which ofcourse is always crowded; people throng these pavilions like as if they’ll never get to see anything like it again. Though Africa, Thailand, Iran, Vietnam, Egypt and UAE do come a close second in terms of popularity. It’s really fascinating, once inside a particular country’s pavilion you are sort of transported into their world. If one side of the pavilion has traditionally dressed traders selling clothes, handbags and footwear, from the other side yummy and exotic aromas will be enticing us to try the special dishes from their country. Another corner could be selling anything from paintings, dried flowers, intricately carved furniture or cleaning mops. And the outside of the pavilion will have a stage where performers will showcase their country’s traditional dances or arts. Even though the Indian Pavilion is a must-see place we give it a miss due to lack of time or leave it till the end as we are familiar with most of the merchandise they display. And the fact that many media channels lie in wait to thrust their mikes into people’s faces to ask silly questions & riddles, all the more make us want to stay clear of the place;-P. Every year my mum will ask “I watch the DSF special on tv everyday and I keep searching for u. Everybody is there except u" she accuses me. And I’ll be like “Ma puh-leeeeze”!!! The children ofcourse start out enthusiastically from home but run out of steam half-way thru because of the amount of walking we have to do. Luckily there is this huge amusement park right next-door with all the wild rides & games which succeeds in rejuvenating their tired spirits;-D.
I don’t shop much, usually am just content to soak in the electric atmosphere but there’s one thing I always end up buying in dozens every year……magnets…yeah those fridge magnets….they are a major weakness;-(. Half the time I end up buying the same stuff what I pick every year and then studiously avoid looking at the better-half’s wry expression the rest of the way home. And then ofcourse we all crib……about the outrageous amount[dh10 per person] they charge as entrance fees when in the initial years we could wander in and out as we pleased or the fact that a simple shawarma which costs dhs3.50 in the bylanes of Dubai is a whopping dhs7.50 inside the GV. But it doesn’t ever stop us from going there again and again. Honestly the DSF doesn’t feel complete without a trip to the Global Village. Years back in 2000[I think] the better-half & I were at the Global Village watching the Red Indians in their traditional attires sitting around, idly strumming their curious looking musical instruments, when a group of Arab men came and stood beside us. The leader of the Red Indians quickly got his troupe together and they gave this impressive performance on the spot. Curious at what prompted the spectacular show we turned to look at the Arab men and immediately recognized the present Ruler of Dubai HH Sheikh Mohammed bin Rashid Al Maktoum standing tall and regal among the group of men. Although he was the crown prince then there was no fanfare or body-guards announcing his presence; he watched the performance for a few minutes and left like how he came…quietly and with no fuss. This whole concept of the DSF and the Global village is actually The Ruler’s brainchild….he has pulled out all the stops to ensure that DSF remains a memorable occasion for everyone who participates in it. Every year there are more & more exciting events & prizes added; today it attracts more than 3 million visitors to Dubai every year. There is a lot more than I mentioned above like the Carpet Oasis where you’ll be spoilt for choice as you have over 150,000 carpets from different parts of the world to choose from. And the Gold Souq is a place you wont forget in a hurry, it is said that the Gold traders here sold jewellery worth Dh10 million each day and what’s more they give away 1 kg of Gold as Prize to a lucky winner everyday. If any of you are planning to visit Dubai, do try to make it during this time when there is excitement in the air and the weather is at its best. I assure you that you’ll never go back disappointed. Most Indians are familiar with the gulf countries but years back I remember meeting an American who never knew there was a place called Dubai. What about you, have you heard about the Dubai Shopping festival earlier???? Have you been here for it???? Are you planning to????? I had heard of Dubai Shopping festival but forgot completely about it! Your descriptions are so vivid, I feel like I was there. "Back home we see a frenzy in travel plans to Dubai for the same." "timings are awesome though - 4pm to 1am?? WOW!!" I have heard about the DSF but never really thought that it would be as nice as you have presented. Wow, you ought to get paid for this piece, seriously. Actually, for me, there is only 1 reason to visit the GV every year and that is - Al Hajj Bundu Ke Kabab. My wife though loves it, just like you do - to pick up stuff that we don't really need. Thank U for the compliment Asif;-D!!!! "**Thinking why actually there can’t be such shopping festival all year long??? 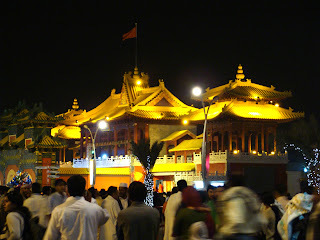 **"
Though the shopping festival is just for a month the global village is open atleast a month before the festival starts. Those who like to avoid the crowd usually go then. Rakesh: Really!!! I've seen the place but never realised they were famous. Thanks for the tip, will file it away carefully for future use;-D.
oh, very vivid description of the global village. Haven't visited this year though. Love the fridge magnets from the Egyptian stall with the pharaoh's head. Its all so wonderful - the pics, the festive look and the showarma - OMG, I want to come to Dubai now !!! How I wish to go during DSF, but the schools here are going full speed for annual exams - where will I take off and come ??? Maybe, when my daughters finish school, I'll put them in a college hostel and come to Dubai and enjoy the DSF, esp the showarma !!! 7.5 dhirams - its Ok, Nancy, its the best !!! we are yet to go inside GV, this wkend maybe n most prob coz we have been wanting to go there for so long and its end date is approaching fast too.. i someone dont like the 4pm starting time.. its kind of limiting.. why not have it from morning till past midnight? have they been doing it like this since the beginning? I would have loved spending the whole day visiting the stalls now that the weather is so kind. i noted rakesh's tip too :) & yes your article on DSF/GV is indeed very good.. This sounds exciting and I am disappointed that the timing will never coincide with our holidays.... One other thing I noticed in blogs from Dubai is the love and respect expressed for its current ruler. Thanks for the links and I hope one day we will get to enjoy the splendor of this festival. I have to give th DSF a shot..although i think its slightly over rated. Sounds like the Disneyland of the Middle East. Although I've never been to the Dubai Festival, I had a stop over there when flying Emirates and the festival was on, i shopped so much at the airport and wrote my address on 100 odd tickets for 1 kg gold! :D and religiously waited for the happy news! Never got it! Do you know anything about ppl who win? I suppose its genuine..
Oh! This post brought back so many of my memories from last year. 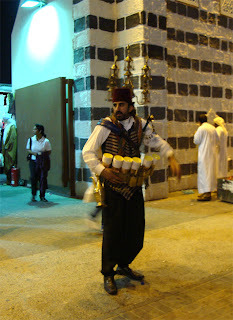 And guess what I have the same pic of the tea-seller outside the Syrian stall! It was one of my biggest regrets this year to have missed the DFS, I so so loved the place and wanted to have a go at it. And your post told me so many things I had absolutely no idea about... the factual details that is, I just enjoyed being at the global village. Loved this post Nancy, I had wanted to and never did my global village post, and now I am happy I didn't, because your is just super duper. And yes, about your question, I do know DUBAI! PS - I so wish we had met before I left. yeah u are right, it is a must see. I can't remember when I saw it last though. Are u still buying magnets? Is the fridge visible at all. Of course, I have heard of the Dubai Shopping festival, husband is pretending never to have heard of it ;) Hopefully one day, I will convince him to hear of it :) The pics look lovely! I so want to go there once. Dont know when i ll be able to make it to DSF..
flabbergasted for the 2nd...?!! still am.. I thought you weren't going to come at the Dubai bloggers meet??? At least that's what you told me... But you're inviting Preeti for it? Your pics are great and same pinch on collecting magnets. I think if I go this way I will have to buy an extra fridge just to display the magnets!! lolz your question reminds me of my American neighbour who believed that Dubai was a part of India and was astonished when I corrected her.. I loved africa for everything they had, iran for their carpets and intricate carpet paintings, egypt & nepal for their brass stuff, masks etc. The performances were good too AND the funniest was special honey for married in Yemen pavillion :D did you happen to pass by that? There's just 7 days left...hurry up, hehe not my words I just got an sms about it;-D.
Umsreflections: LOL ok deal...all similar ones are urs;-D.
We get shawarma's in India too, I had some in B'lore...just tht they dont taste the same. Trendsetters: Its a pleasure!!! And welcome to my space:-))!!!! S: LOL u r right, usually it is not but once in a while just drinking in the sight is good enoff;-D.
An Open Book: Have u been here before???? DSF atleast once will be a memorable but yeah if we see anything too many times it brings down the charm;-). Did I read "Blogger's meet"" somewhere?? Preeti........You are most welcome. As Nancy said, we are waiting for some excuse to meet! Pack your bag! Thanks for prompting! Click "Maddy"
Lan: Just noticed I missed ur comment while I was replying;-o. If u r not able to make it for the DSF then there is something called the DSS between July-Sept; its a sort of toned down version of the DSF but it happens mainly in the malls. No GV or street shows but still good if one is interested in the shopping:-). Passionate Goof: Thank U dear, u r really sweet;-))!!!! Sindhu: Yeah why not??? Just give a few months notice so tht everybody gets a chance to plan their visit accordingly. It will be fun dont u think;-D!!! 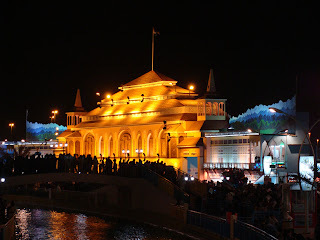 Renu: Its a nice place really....and yeah the DSF is really grand. U must try to make it atleast once:-). Snow: It always happens around dec-jan-feb, try to plan ur visit accordingly;-). Butterfly: "I hope u do and somewhere I have the gut feel that u will!!" Smitha: Thank U:-)!!!! LOL abt hubby pretending not to hear, then u can pan a via Dubai trip when u visit India. Tht way u manage to see quite a bit tho it will be hectic!!! Wanderlust: Aha so it is on everybody's list...look above there was so many saying the same. If u guys plan it together, imagine how much fun it will be!!! Mystery: aaah it must be good fun huh...I love the hyderabadi biriyani. We've been planning a visit there but for some reason its not materializing;-P.
Blunt Edges: I hope so too;-))!!! Piper: Thank U:-)!!! Do make an effort to visit atleast once...its quite worth it!!!! I'm not sure I really want to know anybodys mind and their thoughts...it could be quite disappointing also, have u considered that???? Sakshi: U lived in Dubai??? I never knew tht. Tell me more???? Mindspace: Canada I think is combined with US and Japan was there 2 years back tho I dont remember seeing it this year. Lostworld: Shall I courier it;-D!!! 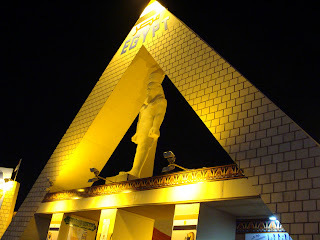 yeah been to global village last two years but not this time, its a enjoyable experience and two hands a trolley doesn't seem enough to grab the attractive sale. Wow ur parents are here huh....on tht basis alone everything is forgiven. Have a wonderful time:-))!!! Somehow till now we've never caught any of the DSF attractions. But speaking of GV, my aunt said that these days most of the stuff has a 'made in China' stamp ..... so its no longer really global. Have you observed the same? actly, i don shop @ all... thts y din read dis post... sry! pps. love to u n to the nieces... muaah! Wow, this sounds really fun experience, specailly with the way you described it. Would love to come and enjoy it some time,just don't know when !! Great pics!!!! You should have been in advertising! Would love to attend the Dubai festival someday! sounds like sooooooo much fun!!! i love it when u can interact and learn more about different cultures right in ur home town. i mean yeah shopping n all is good but when u described the country pavilions ...to me that was the best! What a wonderful idea!! I loved the concept of the Global village- have been to smaller such ideas in different places- but this sounds really wonderful. I would love to stroll through and get a 'taste' of each region and country. As for Dubai- yes I know it well- and have had the pleasure of stopping over on a few occasions when I used to fly from Accra to Singapore on Emirates. @death...u r between 22-25yrs, I dont blame u..at tht age nobody is;-). The reason why I particularly asked abt the 3rd is bcoz u being spiritually tuned I was interested in ur answer. U didnt read the post;-o!!! If u had read it u wd have known it was not only about shopping:-)). Nilu: Thank U!!!! And do make an effort, its totally worth it...atleast once:-). Limenlemons: Yes its really worth it....there's so much to see and learn if we are interested:-). Dil Se: Just realised I missed replying to ur comment;-o. And to answer ur question..yes it really is, do make the effort to visit atleast once:-)). Brocasarea: Hehe u'll be suprised at how many literate fellow-beings dont know;-P.
Sulo Badri: Quite in awe[without being condesending] that a person as young as u is so spiritually inclined. Thanks for elaborating, I was really interested in ur answer;-). how much money does the festival collect every year and how much does an average person spent? any idea? I dont knw abt 2010 since the festival isn't over yet but it is said tht a record 3.35 million visitors spent about Dh9.8 billion on average during the 32-day DSF 2009. Such a lovely blog! You know, I was all set to visit DSF this year, and a change in a family member's schedule has us cancel off. Oh well, next year perhaps. But thanks for bringing me these images:) I enjoyed reading your post. Loved the photos and the write up Nancy. I have been to Dubai only for one day!, did not get to see much other than from an outside drive. This is something to keep in mind, to come during DSF. Sulo Badri: LOL if I'd watched the match u can be sure India wd have lost;-D.
Sharon: Hopefully ur plans for the next visit will be problems-fee:-). Thank U and welcome to my space:-)!!! Lakshmi: Do make the effort...infact now I thk Emirates has this offer tht if u travel with them they give u free visa. Dont miss it!!! !